A view of the book with the front cover, the sewing, the colored and laser itched edges. Another view of the book with the front cover and the sewing and the colored edges. The book opened showing the front and back covers and the itching on the sections. The sections of the book with the laser cut words in Arabic Kufic script “al-sha`b yurid isqat al-nizam” – “The People Want to Bring down the Regime”. The last section of the book with the words “Al Saa’b Askat al Nezam” with its English translation “The People have brought down the Regime”. Egyptian uprising called for democratic reform. Tahrir Square in Cairo became the focal point and the most effective symbol of the protests in January and February 2011. For 18 days Egyptians repeated the slogan: The People Want to Bring down the Regime (al-sha`b yurid isqat al-nizam) until the regime stepped down on the 11th of February 2011. “This book focuses on the revolution slogan ‘al-sha`b yurid isqat al-nizam.’ Using Arabic Kufic script the words of the slogan are repeated in an ascending sequence. Section 19 contains the English translation for the slogan ‘The People Want to Bring down the Regime.’ The last section contains the time and date when the regime stepped down along with the sentence ‘Al Saa’b Askat al Nezam’ with its English translation ‘The People have Brought down the Regime’. “Cairo’s map is laser engraved on the book covers. 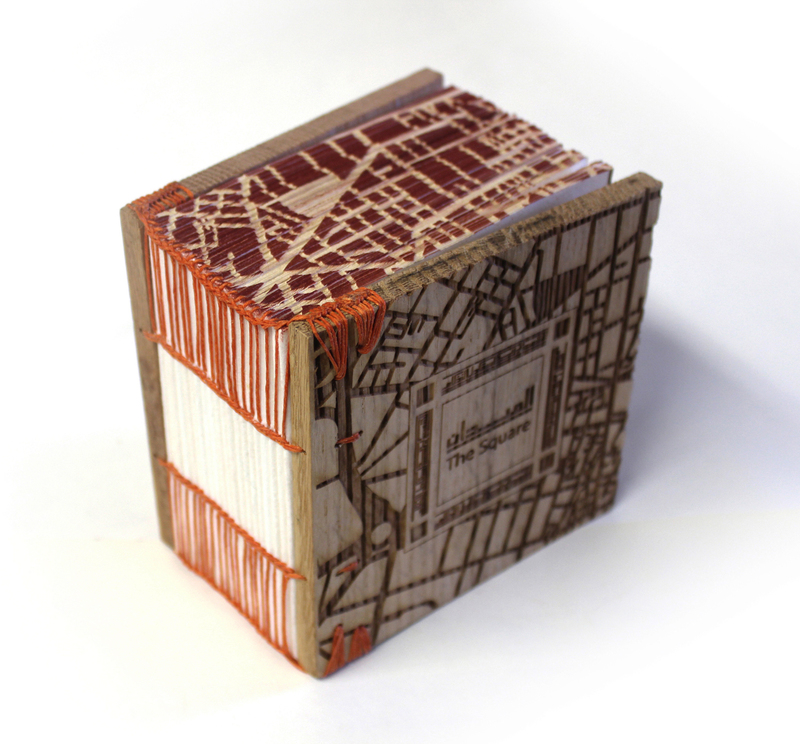 Three edges of the book are colored then laser engraved to show the streets of Cairo.